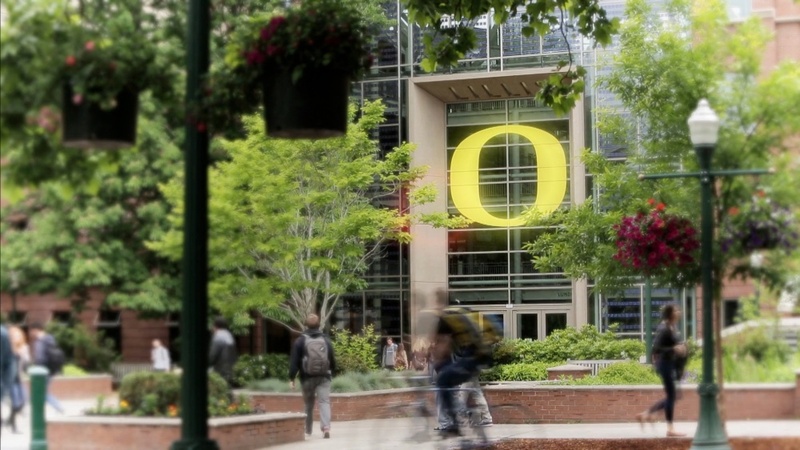 A Duck known for his success as a venture capitalist and his wife are investing in University of Oregon academics through a $1 million gift that will establish a new faculty chair in the Charles H. Lundquist College of Business. The gift by Grant and Suanne Inman is doubled by $1 million from the Presidential Fund for Excellence created by UO President Michael Schill. It’s the first such match since Schill announced a $50 million anonymous gift to the UO, which generated funds for an expansion of research, discovery, student success and faculty hiring. The Inmans responded rapidly to the new UO fund, capitalizing on the one-time matching initiative. Grant Inman said it was an opportunity to help UO students cultivate their abilities in innovation, entrepreneurship and leadership in order to become assets to communities in Oregon and beyond. “These are all attributes business leaders have, and I wanted to see that emphasized in the Lundquist College curriculum,” Grant Inman said. Grant Inman graduated from the UO in 1964 with a degree in economics. He served as a general partner of Hambrecht & Quist and several private venture capital firms before founding Inman Investment Management of Orinda, California. He served as a UO Foundation trustee from 1995-2000. He is currently a trustee of the University of California, Berkeley Foundation and is a Berkeley Fellow. He and Suanne Inman, a 1964 graduate in psychology, are longtime supporters of many areas of the UO, and this is their second recent major gift in support of faculty at the Lundquist College. A generous gift in early 2017 created the Inman Endowed Faculty Fund in Innovation and Entrepreneurship. They were also early backers of the thriving University of Oregon Investment Group, a training ground for student investors. “The investment group has sustained itself, become very successful and been a good draw for high-performing students coming to Oregon,” Grant said. The Inmans’ endowed chair will provide funding for salary, research, graduate student support and other expenses. Such funds enable faculty members to pursue their academic interests and related business world activities, increasing the university’s competitiveness in attracting the highest caliber scholars. The family’s continued support is having a far-reaching effect, said Sarah Nutter, Edward Maletis Dean of the Lundquist College of Business.